If you seen our bunny pudding cups or the I “Chews” You treat then you know that we have been making Valentine’s gifts around here. I love this time of year. There are some many cute arts and craft projects to create. Today, we are making “You blow me away” dynamite sticks. 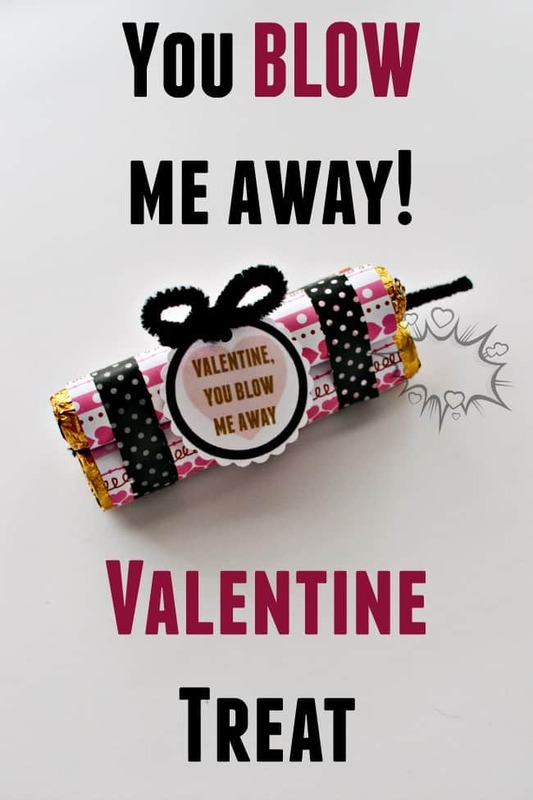 These are really simple to create but oh so cute to give to someone as a sweet Valentine gift. Although these would work great for a classmate treat giving 3 packs of rolos to each child might be a bit much. I think this idea would be perfect for your own kids, a significant other, family member or even the teacher. 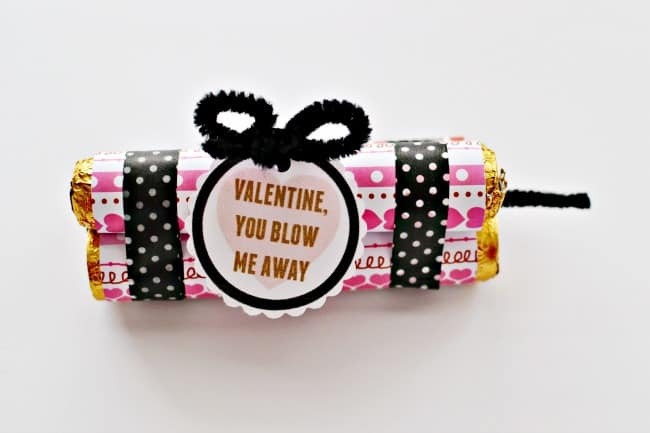 For a classmate version you could always wrap just one separately or even using smaller packages such as smarties. 1. Carefully remove one wrapper from the rollo package and trace around it onto the back of your scrapbook paper. Repeat 2 more times to get wrappers for all 3 sticks. 2. 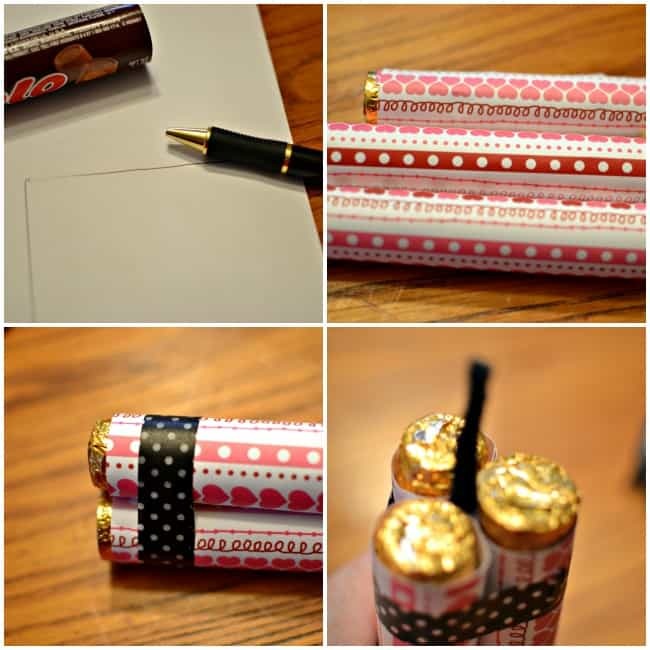 Attack your wrappers to the foiled rollo package by either using a glue stick or regular tape. 3. Now you can bundle the “dynamite” sticks together with electrical tape or washi tape. We chose washi tape because the polka dotted black washi was cute and festive. 4. Cut a black pipe cleaner in half and stick it down the middle of the bundle. 5. You can give the gift just as is and write on one of the sticks or you can print out the free printable (below). If you choose to use the printable you can wrap it with twine or we used another black pipe cleaner and hole punch to attach the printable. The printable we cut out using the paper studio punch. If you don’t have one hand a pair of scissors works just as good. These would also make great 4th of July treats with a quick switcheroo of the scrapbook paper and skipping the Valentine printable. Clever Idea! I was… wait for it… blown away! Unique and interesting. I like it! I love this! i wish I was this clever!